The battle over climate change is heating up in Washington – as President Barack Obama’s nomination of Gina McCarthy to lead the Environmental Protection Agency sets the stage for a struggle over regulations intended to reduce carbon dioxide and other emissions. In his inaugural address, Obama had already signaled that climate policy would be a high priority for his second term. But Senate passage of a climate change bill that might impose new costs on the oil, coal and gas industries seems unlikely, especially since the Republican-majority House would be nearly certain to oppose any such effort. President Barack Obama announces the nomination of Sylvia Mathews Burwell as the Director of the Office of Management and Budget. Obama also introduced Gina McCarthy as nominee to head the EPA and Ernest Moniz to take over the Energy Department. The EPA will be at the center of the climate change action. Kyle Danish, a partner in the Van Ness Feldman law firm in Washington who specializes in climate change policy, said he expected McCarthy to face tough questioning during her confirmation hearing before the Senate Environment and Public Works Committee. But he thinks it unlikely that Republicans will block her. “Though McCarthy is by no means pro-industry, industry groups generally respect her and believe that she gives them a fair hearing,” Danish said. Assuming she is confirmed, McCarthy can begin to try to transform Obama’s climate change rhetoric into regulatory reality. Doniger said power plants account for 40 percent of carbon emissions and “that’s where the EPA under Gina McCarthy will need to focus. As you look at where the carbon pollution comes from on the industrial side, the single largest thing is coal- and gas-burning power plants.” The NRDC has proposed a plan for using the Clean Air Act to cut that pollution by a third by 2025. 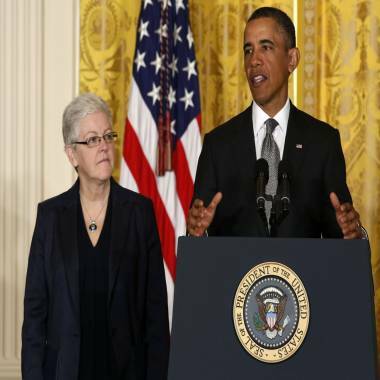 President Barack Obama nominates air quality expert Gina McCarthy to lead the Environmental Protection Agency on March 4, 2013 in Washington, D.C. Yet to be seen, he said, is whether the EPA will issue a final version of its rule on new power plants this spring, or whether it will withdraw and reconsider that proposal. Many of EPA’s decisions end up having their fate determined by the U.S. Court of Appeals for the District of Columbia Circuit. The Clean Air Act of 1970 includes a provision that requires legal challenges to EPA standards of national scope to go only to the Court of Appeals for the D.C. Circuit. There are now four vacancies on that court, out of 11 authorized judgeships. The court has four judges appointed by presidents George H.W. Bush and George W. Bush, and three appointed by President Bill Clinton. Due to Republican delay, Obama has not been able to appoint any judge to the D.C. Circuit Court. He has two nominations to that court pending before the Senate, those of Caitlin Halligan, who has already been approved but the Senate Judiciary Committee, and Sri Srinivasan, who hasn’t yet gotten the committee’s approval. Senate Majority Leader Harry Reid announced Monday that the Senate would vote on Halligan’s nomination this week. He will move for a cloture vote on Wednesday to end debate on her nomination.